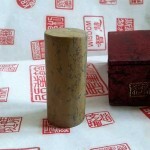 Rubber Stamps are used throughout China for several purposes, such as for signatures, stamping to creative works such as greeting cards, wallpapers, clay products, and in other designing art works. Normally, rubber stamps are available in sets. They are used for depicting motifs, decorating gift-wrapping, and on greeting cards. These days, stamps come in packaged sets that include a small box containing the rubber stamps, notepaper, indexing labels, and a non-toxic, gold inkpad. Chinese Coin Longevity stamps are made in the design of an ancient Chinese coin with Yin Yang, Longevity symbols added. They are used in creating artwork for embellishing gift-wrapping, and designing hand-made greeting cards. 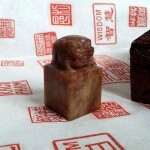 This type of rubber stamp is designed with a Chinese dragon image. It is used in many hand-made cards and creative art works. This stamp is designed with a Chinese character “Ai,” which means love. It is very simple and interesting to use in a variety of applications. These are available in sets and are designed with a variety of icons. Yin Yang stamps convey the richness and diversity of Chinese culture, and have been created for sophisticated artwork and for making beautiful gifts. These sets consist of indexed wood mounts topped with self-adhesive rubber images and a black inkpad. These sets consist of rubber stamps with an image added and a pigment inkpad. Images show certain characters like “Good Luck” and “Long Life.” They are used for many creative art works. There are several types of stamps for good wishes. 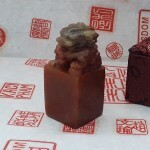 They represent wishes like Ru Yi (Good Wishes) and Fu Shou (Fortune and Long Life) and are available in every general store. This stamp is made with a design of a dragon and phoenix chasing each other, which symbolizes Yin and Yang (male and female). The stamp is mounted on wood.